Tomcat 21 with all the standard features. 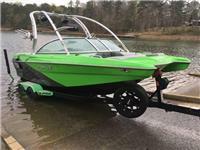 Plug and play, Switch Surf, Zero Off, Heater, Exile Audio system with one set of Surf Tower Speakers, Surf Pipe, Surf Lights, extra transom hooks. Well taken care of boat that makes a great surf wave. 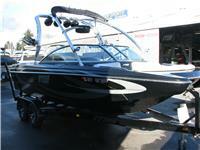 This boat is very clean and just had a full service while getting winterized. It runs very strong. The factory warranty is fully transferable. Factory mooring/towing cover and the shipping cover are included. Boat Mate Trailer, Mooring/Towing Cover. I am interested in your 2018 MB Sports F21 Tomcat and would like more information. Please let me know. Thank you!